Besides the obvious perks of world travel and service to one’s country, there are an enormous number of educational benefit programs available around the country for the families of military personnel. These differ in the amounts of funding they have to offer, who they can disperse money to, the types of programs they will sponsor, and the length of time in education which they will agree to fund. Across the board, these generous programs have been designed and put in place to offer as much educational opportunity with as little financial hardship as possible to those who have committed a portion of their life to military service. Some of these programs offer the same benefits to the spouse and the children of the military member as they do to the military member themselves, while other programs offer different benefits to each family member. Make sure to review the guidelines below carefully, and adhere to all application requirements in order to be considered for one of these valuable military benefit programs. The Survivor’s and Dependent’s Educational Assistance (DEA) program will help the spouses and children of select deceased or missing military personnel in obtaining higher education. The Department of Veteran’s Affairs also has an abundance of financial programming intended to support the survivors and dependents of the military, including the Dependency and Indemnity Compensation (DIC), the Survivor’s Pension, and The Civilian Health and Medical Program. Very specific criteria must be met to qualify for the range of financial assistance that the VA and the DEA offer in this regard. According to the post 9/11 GI Bill, educational funding will be approved for degree and certificate programs, on-the-job training, and apprenticeships. Spouses may be eligible to take correspondence courses (distance-learning) as well. Tuition assistance will be given for up to 45 months of qualified education. For the spouse, the benefits will end 10 years after the death date of the veteran spouse or from the date of eligibility. For the children, with the exception of special circumstances, all applicants must be between the ages of 18 and 26 to qualify for this program. Special Restorative Training and Special Vocational Training opportunities may also be available to eligible individuals. This addition to the GI Bill became active in 2009 and honors the memorial of John Fry who died in the country’s service in Iraq in 2006, leaving behind his family, including his wife and small children. Under this amendment, eligible children of a veteran who dies in the line of service may receive up to 36 months of 100% tuition benefits, a stipend for housing and book allowance for undergraduate education at an in-state public institution. The monies may be taken advantage of up to 15 years after the child’s 18th birthday. Students may also choose to attend a private institution, but in this case the award amount will be capped at $17,500 per year. The Marine Gunnery Sergeant John D. Fry Scholarship may not be used in conjunction with some other benefits such as the Yellow Ribbon Program. Eligible students may apply through the Department of Veteran’s Affairs. In the past twelve years, Fisher House has awarded more than $10 million dollars in educational backing to children and spouses of those in the military. Their Military Children Program is sponsored in part by donations from manufacturers and suppliers of military products. $1500 scholarships that go towards tuition, fees, books, lab supplies and other educational costs are awarded to qualified applicants from various commissary locations throughout the US. Unmarried dependents under the age of 23 who wish to attend an accredited university may apply for this scholarship. Hero’s Legacy Scholarships award the children of military member who has died or been permanently disabled in service after 2001. These awards are funded from the proceeds of a letter/book that Barack Obama wrote to his daughters, “Of Thee I Sing”. Scholarship grants from this program will cover the full cost of tuition, room and board, and fees at the college of the recipient’s choice. A similar award is open to spouses of military members who wish to pursue a GED, degree program or other form of training. No Angel Left Behind honors fallen soldiers and wounded warriors by providing financial aid to their children to help them like the American Dream. Children of a military member who was killed or permanently disabled in service may be eligible for one of several scholarships available from Freedom Alliance. This military support organization works to promote education and has given away over $5 million in scholarship funding to deserving students over the past few years. Students who receive a Freedom Alliance scholarship can use the money to attend any public, private or vocational training program that is accredited in the US. Application information can be found on the website. Spouses and dependent children of a deceased or POW/MIA military member may qualify for free tuition for undergraduate degree pursuit at a school like the University of Alaska – Fairbanks. The armed forces member must have died in the line of duty or due to injuries sustained in the line of duty, or be listed as POW/MIA. This scholarship offers free tuition for the undergraduate student for up to 36 months. The program is overseen by the Alaska State Office of Veteran’s Affairs, and everyone wishing to apply must contact a University of Alaska – Anchorage, University of Alaska – Southeast, or University of Alaska – Fairbanks Financial Aid Office in Alaska. Eligible applicants will receive free tuition and housing aid from the state of Arkansas’s POW and Dependants of POW/MIA/KIA Service Members Program. The service member must have been a resident of Arkansas when they entered into active duty. Other information and an application may be obtained from the Arkansas Department of Education. The California Veterans Education Assistance Program will assist the spouses and dependent children of service-related disabled or deceased veterans in the form of tuition and fee waivers for eligible applicants in the state of California. Applications may be downloaded from the CalVet website. For more information, the applicant’s local county veteran’s service office needs to be contacted. Spouses and children of POW/MIA/KIA service members may be eligible for free tuition and a possible cash allowance from the State of Louisiana Department of Veteran’s Affairs. To be eligible, the service member must have been a resident of Louisiana for at least one year prior to their active duty status. Children applying for this program and the Yellow Ribbon Education Enhancement Program must be a resident for at least 2 years prior to the time of admission into school. Applications and more information are available though the Louisiana Department of Veteran’s Affairs. The children and spouses of those service personnel listed as POW/MIA may qualify for free tuition and fee waivers through the South Dakota Department of Veteran’s Affairs. Applicants may not be eligible for any federal educational assistance programs which are the same or greater in benefits. Please contact the Division of Veteran’s Affairs for more information and to apply. Free tuition and fee waivers are available to eligible family members of armed forces veterans in Wisconsin. The Wisconsin GI Bill provides that the spouse and unmarried children aged 18 to 25 may apply. The veteran must have been a resident of Wisconsin for at least 6 months prior to obtaining their active duty status, and the applicant must currently be a Wisconsin resident. The spouse may attend school in either full-time or part-time status, but the child must attend full-time any University of Wisconsin System or Wisconsin Technical College System school. A PDF file downloadable information booklet and application is available at the website. 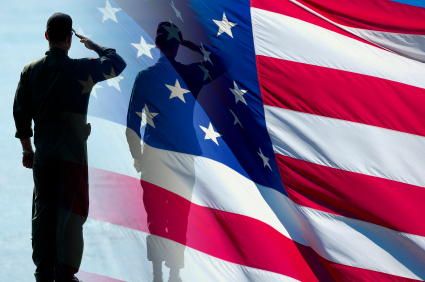 Since so many of the military’s programs for its members exist in regional and local form, it is to your benefit to check into resources that may be sponsored by your state or general area, such as the Alabama Department of Veteran’s Affairs. In addition, some private and public college networks offer special scholarships that only military associates are eligible for, like the Military Service Recognition Scholarship that funds degree programs at colleges in New York State. The Everest family of colleges and universities on over 80 campuses also provides special benefits and compensation for the military and military-related families. The United States Department of Veteran Affairs and Military.com are central go-to resources to keep updated with as new scholarships appear and benefits change.